The influence that friends and peers have on children should come as no surprise to adults. We were all children ourselves, after all, and even if it’s something that we grow out of, many children and teenagers are hesitant to do anything that doesn’t have the approval of their friends. This is increasingly true in today’s age of social media, where every facet of one’s life is seemingly talked about all the time. That’s why, if you’re considering enrolling your kid in martial arts, it can be a great idea to see if a friend wants to join in as well. While this is a decision that would come down to their parents, it’s not uncommon for parents of different kids to form friendships with each other. If you’re able to coordinate it, there are a few compelling reasons why it’s a great idea to sign up for martial arts with a friend. When you sign up with a friend, particularly at the same time, it presents a unique opportunity in that the two students can help each other to grow in martial arts. If they’re attending the same classes, they will likely advance through belts at a similar pace. To truly master each belt, some in-home practice is required, such as practicing a form. When students are friends outside of class, it’s easy for them to motivate each other to do this, and in the best-case scenario, could even stave them off from the siren-song of Fortnite for a little bit. Unless parents are being extremely vigilant when they come to classes, it can be hard to keep track of all the moves their kids are learning. But with a friend, they’re learning the same material, which means they can easily help each other out if something needs work. For example, if a kid is practicing their form outside of class, a parent may not be able to identify whether their kicks are being executed correctly, but a fellow student could. One obstacle that many children have in engaging in new activities is the fact that they may not have any friends in whatever activity they’re doing. Unless the child is outwardly social and extroverted, they may not go out of their way to make new ones once they’re there. And this, on its own, can make the prospect of kids karate very unappealing to a child. Having a friend there from the onset provides them with someone to chat with, sit next to, and practice with. It provides familiarity and comfort, and makes it more likely for them to want to come back. 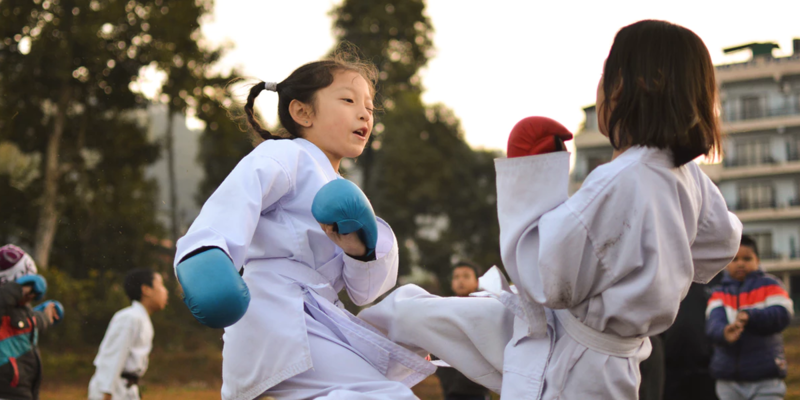 Does your child have a friend that they may want to consider trying martial arts with? The good news is that our trial membership can allow them both to try out our classes at Thrive Martial Arts without committing to a full membership. That will allow both kids to find out if taekwondo is right for them. Interested in signing up? Read more about our trial memberships here, and contact us today if you have questions!